Born in 1824 in rural Ohio, Phoebe Cary, alongside sister Alice Cary, made a name for herself in American Poetry. Phoebe Cary was one of nine children to Robert and Elizabeth Cary. As a child, Cary suffered the loss of her mother and two sisters. Religion and death appear to be reoccurring themes in Phoebe’s life. When she and Alice moved to New York City in 1850, they published collections of their works both together and separately. 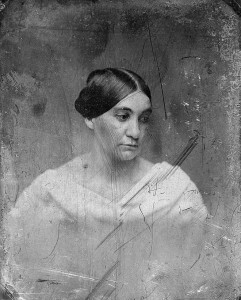 Along with Phoebe Cary’s literary publications, she was also an editor for Susan B. Anthony’s The Revolution. After the passing of her sister Alice in February 12, 1871, Phoebe died five months later on July 31, 1871. For more information, click here or here. 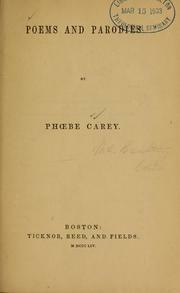 Phoebe Cary’s Poems and Parodies collection was published in 1854 and has not been further recovered, but was republished many times over the years. The poetry in the collection focuses on religious and death-related themes, many of which reference the women who had passed away during Phoebe Cary’s childhood. Writing during the time of the Second Protestant Great Awakening, it is no surprise that Cary would bring her religious beliefs into her pieces. As someone who did not stay quiet with her opinions, Phoebe Cary spread her religious beliefs through her poetic pieces. She also uses these religiously themed pieces to touch on the losses in her life and how she envisioned her loved ones’ journeys to Heaven as well as the forgiveness given to them by God. Many of her parodies center around relationships and the gender roles that she is mocking. Within her piece “The Change,” she speaks of the love for a wife from the second-person perspective of a husband. Whereas the poetry focuses on religion and death, her parodies are where she explores other subjects and those more popular in the literature of the nineteenth century such as gender roles, marriage, and romance.